Noisy Planet resources can help you incorporate healthy hearing messages into your family’s daily routine. Learn about the different types of hearing protectors, from ear plugs to ear muffs. Find teachable moments to begin a conversation about hearing loss and noise. Pick up a few quick tips to help maintain a quiet home. Read about how parents can teach children who live or work on a farm prevent noise-induced hearing loss. Use our resources to help remind your children about how loud some common sounds can be. Learn more about the sounds around us and how they can affect our hearing. What makes mammals’ ears special? Learn some fun facts and read interesting stories about our noisy planet in Have You Heard? Sign up for our email newsletter. Get information on noise-induced hearing loss sent directly to your inbox. Use our free materials—bookmarks, posters, fact sheets, and other products—to encourage healthy hearing habits with your children. Use our free resources to help you engage with your children, and spread the word about hearing protection with our Images to Share. Noise is all around us. 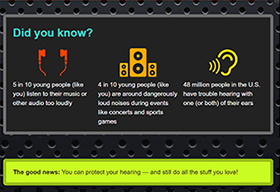 Find out how loud different sounds are, and learn to protect your hearing.